While most people handle recreational gambling in a responsible and controlled manner, it can become an overwhelming addiction for many others. It is important for people to understand that gambling is not a risk-free activity and that it is becoming increasingly important to learn risk factors, warning signs and strategies to protect yourself or someone you care about. Educating consumers about gambling is vital but so is providing awareness for educators, helping professionals, organizations and communities. 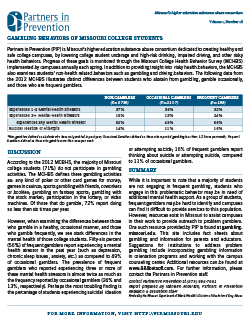 Compiled here are resources to provide basic information on gambling behavior to students and important gatekeepers in our communities and colleges. Reducing risk factors and practicing responsible behavior are essential to maintaining and achieving a balanced and healthy lifestyle. The most recent research estimates that 6% of college students in the U.S. have a serious gambling problem that can result in psychological difficulties, unmanageable debt and failing grades. Research has shown that teenagers and college-aged young adults are more impulsive and at higher risk for developing gambling disorders than adults. Most adults with a gambling problem started gambling at an early age. Scientists have learned that the adolescent brain is still growing, which accounts for the frequently impulsive behavior and unwise decisions of teenagers. Compared to female college students, research suggests that male college students are more likely to have gambled in the past year, gambled with more money and reported having gambling problems. Gambling disorders are associated with numerous negative consequences and are highly correlated with other risky behaviors in the college student population. Compared to students without gambling problems, students with gambling problems are more likely to use tobacco, drink heavily or binge drink, smoke marijuana or use other illegal drugs, drive under the influence and have a low GPA. Approximately 75% of college students gambled during the past year (whether legally or illegally) with about 18 percent gambling weekly or more frequently. Lotteries, card games, pools (including raffles charitable small stakes gambling), sports betting and games of skill (e.g., bowling, basketball, pool, golf, backgammon, darts) are the most frequently chosen gambling activities by college students. Both student athletes and students who are sports fans gamble more than other students. The National Collegiate Athletic Association (NCAA) has identified gambling by athletes as a major threat to the integrity of intercollegiate athletics and responded with the development of a comprehensive education program for student athletes at NCAA member schools. Casino nights, poker tournaments and other gambling activities are popular at special events sponsored by campus organizations and fraternities and sororities. Despite the prevalence of on-campus gambling, only 22% of U.S. colleges and universities have formal policies on gambling. Disordered gambling is a highly cognitive condition. Despite the need for additional treatments and the likelihood that these will emerge, based upon current empirical evidence, CBT is the primary psychotherapeutic modality for the treatment of disordered gambling; currently, it also is the most broadly utilized primary counseling modality that is supported by randomized controlled clinical trials demonstrating efficacy and improved clinical outcomes (Bujod et al., 1994; Sylvain et al., 1997). The goal of CBT for gambling is to identify and change “cognitive distortions and errors” that are associated with intemperate gambling and its adverse sequelae. For example, beliefs in an eventual big win, being unrealistically lucky, superstitious behavior, as well as selective and distorted memory are characteristics of cognitive distortions that often are associated with disordered gambling (e.g., Ladouceur et al., 2002; Ladouceur & Walker, 1998). Perceptions of self-include how money links to self-esteem, social status and power. The “illusion of control” over gambling outcomes is a core cognition that influences disordered gamblers. This sense that one has the “omnipotent skill” necessary to beat the odds is an enduring characteristic of pathological gamblers. Finally, CBT attends to the effect of gambling on others and attempts to minimize the negative impact on family, work and personal finance. Ladouceur and colleagues at Laval University in Quebec (Bujod et al., 1994; Ladouceur et al., 2002; Ladouceur et al., 1998; Ladouceur & Walker, 1998; Sylvain et al., 1997) have developed a treatment program model based on cognitive behavioral principles that includes four components: (a) correcting cognitive distortions about gambling; (b) developing problem solving skills; (c) teaching social skills; and (d) teaching relapse prevention. These key CBT techniques central to gamblers are outlined below. Cognitive restructuring for gambling disorders reflects interventions that are directed toward changing unhealthy gambling behavior by correcting distorted thoughts, beliefs and attitudes about playing and winning games of chance. It begins by enhancing gamblers’ awareness of specific gambling thought distortions and errors in judgment so that they can begin to make better decisions and choices. This goal can be achieved by thoroughly reviewing a person’s gambling experiences, strategies and expectations as well as by monitoring their current gambling behavior. This will provide clinicians with the opportunity to describe, assess, and evaluate a gambler’s cognitive pattern of activities. For example, one of the commonly observed distortions among disordered gamblers is known as the “Gambler’s Fallacy.” This cognitive distortion represents a gambler’s belief that they can predict future randomly determined gambling outcomes based on their observations and analysis of past random gambling events. By examining the specific gambling thought processes that support distorted ideas, beliefs, reasoning and decisions and then correcting and reframing them, clinicians can effect change in disordered gambling behavior. Cognitive restructuring interventions correct distortions in thinking regarding numeracy, games played, betting systems, superstition, selective memory, attribution and causality. The development of problem solving skills can assist individuals struggling against their impulses to gamble excessively to feel improved control over their gambling risks and consequences. Problem solving strategies address therapeutic themes that include dealing with gambling urges, deciding about limits on the time and money spent gambling, resolving difficulties with family members and finding suitable solutions to gambling debts. The problem solving process involves a number of steps: identifying the problem accurately, collecting specific information about the problem, generating different options, exploring consequences by listing advantages and disadvantages for each, and then implementing and evaluating the preferred solution (e.g., Goldfried & Davison, 1976). There is a range of social and life skills that can benefit a gambler in recovery. These include communication, assertiveness, numeracy skills, refusal skills, as well as the self-management of stress, anger, and anxiety. Therapeutic life skills training also includes relaxation, physical activity and meditation. CBT tactics applied to disordered gamblers often incorporate role play (e.g., practicing refusal skills), imaging (e.g., anticipating an effective coping sequence, re-experiencing a disastrous gambling event and creating a more acceptable outcome), goal setting (e.g., deciding limits on gambling occasions, time & amount of money spent), psycho-education (e.g., learning the signs and symptoms of problem and pathological gambling), impulse management (e.g., controlling urges to gamble), and self-monitoring (e.g., money and time spent gambling). A detailed discussion of this broad area is beyond the scope of these guidelines. Interested practitioners are encouraged to examine relevant materials from the alcohol field (e.g., Project MATCH manual) and the cocaine literature (e.g., NIDA’s cognitive behavioral manual for cocaine addiction) as a basis for exploring specific topic areas and selected exercises (Monti, Abrams, Kadden, & Cooney, 1989; National Institute of Drug Abuse, 1998; National Instituted on Alcohol Abuse and Alcoholism, 1995). The Problem Gambling Institute of Ontario has a great guide on evidence-based practices and problem gambling treatment. Delong, W. (2006). Gambling: The new addiction crisis in higher education. Prevention File 5-7. Hardy, T. (2006). “A minute to learn and a lifetime to master”: Implications of the Poker craze for college campuses. New Directions for Student Services, pg. 33-41. Laker, J. (2006) Ethical and practical considerations for developing institutional gambling policy. New Directions for Student Services, pp. 73-82. McClellan, G. & Winters, K., (2006). Gambling: An old school new wave challenge of higher education in the twenty-first century. New Directions for Student Services, 9-23. Romer D. ( 2005). Youth betting on cards rising. The Annenberg Public Policy Center of the University of Pennsylvania. Shaffer, H., Hall, M., Bilt, J. (1999). Estimating the prevalence of disordered gambling behavior in the United States and Canada: A research synthesis. American Journal of Public Health, 9, 1369-1376. Slutske, W, Jackson, K., Sher, K. (2003). The natural history of problem gambling from age 18 to 29. Journal of Abnormal Psychology, 2, 263-274. Slutske, W. (2006). Natural recovery and treatment-seeking in pathological gambling: Results of two U.S national surveys. American Journal of Psychiatry, 163, 297-302. Stinchfield, R., Hanson, W., Olson D. (2006). Problem and pathological gambling among college students. New directions for Student Services, 63-72.